Invest In Mentoring, Not Guns! For a Safer Tomorrow. The violence seems to be getting worse this year. This past weekend a jogger was stabbed, young ladies were blindsided by baseball bats for their purses, and more gang violence was reported by Chicago's media. Summer and its annual spike in street violence looms. Everyone is uptight. Motivated by fear and helplessness, some Chicagoans insist that the city lifts its ban on concealed weapons so we can protect ourselves. The state itself is now considering sending in the national guard. But before we turn Chicago into a scene from the wild, wild west... shouldn't there be more investment by more leaders in more places, using volunteers and service-minded resources – many of which are already in place - to address the root of this complex problem? I realize there is potentially no short term relief or solution in sight at this point... this is a mess. But imagine if there had been more investment in, say, mentoring programs for at-risk youth 20 years ago, the parents of kids wielding baseball bats and guns today might have been in a position to make better parenting and life decisions... and they might have had a broader academic skill-set that might have opened new doors for them and their kids. Maybe there would be fewer in poverty today, fewer in jails, and a dent in the number of kids that we taxpayers are now responsible for, as a new generation takes to the streets and starts their own families. We owe it to ourselves, as part of any comprehensive solution, to start investing a little more in preventative maintenance now, so that our kids have a safer and more tax-friendly Chicago in 20 years. 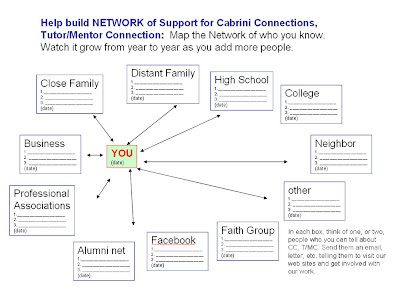 Start by investing as a sponsor for Tutor/Mentor Connection (T/MC), the hundreds of programs they help support, and the T/MC maps featured on this blog. At T/MC we continue to build our mapping capacity and look for new innovative ways to explore patterns in data that will be used in long-term strategies to address issues related to education, community, workforce development, and the wars on poverty, crime, and taxes - all through tutoring/mentoring. Many politicians and business leaders are currently advocating mentoring programs because they show promise in relieving overburdened schools and under-equiped parents in high-poverty neighborhoods... improving the chances that kids will choose college over guns. While some groups make maps that simply show location and address data for crimes or programs, our system focuses on our in-house database of existing/known mentoring programs, and is able to show relationships alongside poverty, school, crime, business, and other community asset data. 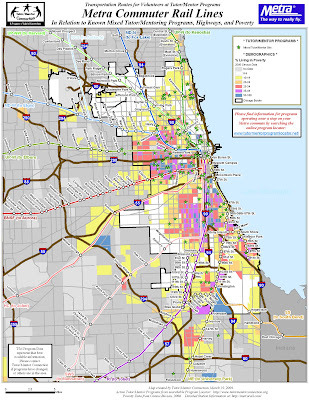 By taking a birds-eye look at a T/MC map, we can expose gaps where new programs are needed, in “high poverty” “at risk” neighborhoods. We can also show many of the resources in those neighborhoods (places of worship, hospitals, universities, and of course businesses) that are, or might be able to support existing or new non-school programs... to help kids make better life decisions (mentoring) while acquiring new academic skills to better prepare them on their journey toward higher education versus the streets (tutoring). We can then zoom into a political district or ward, and show business or faith leader where potential allies might exist, providing a wealth of strategy documents (accumulated from over 30 years of T/MC experience) that suit each alliance's specific mentor-program-building strengths. Our maps can make better sense of the violence as well, by supplementing the reporting we get from media outlets. See, while the media simply reports the crimes, with very little discussion of the core of the problem, or those working hard for long-term solutions to this complex drain on our economy and emotions... we provide maps in static and online/interactive formats (beta version), to analyze and address patterns of poverty, stressed schools, and crime. In my new series of maps, I provide an example of how we supplement the media's effort to “track” homicides in Chicago this year. 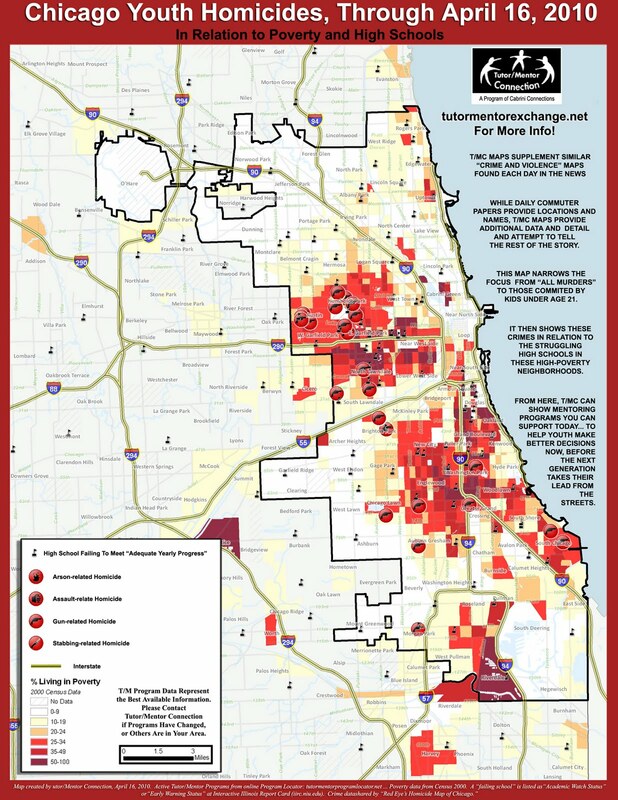 The second map (just above) addresses potential confusion and misconception that might exist when the public reads, ad nauseam, about teen violence, Chicago Public Schools violence, and gang violence, and then sees a "homicide tracker" that includes all homicides in a city of millions. When I take the homicide data and select only those murders committed by kids under the age of 21, we see a cleaner picture of where the "at-risk" kids are being lost to the lure of the street. (Click on any of these maps to take a look at a bigger version of each map, by the way). So, what can be done? 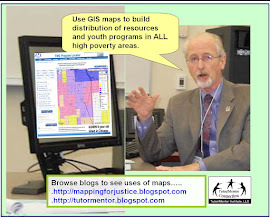 We can now look at a map like the third one above which hits our T/MC database and finds all known mentoring programs in proximity to crimes commited by youth. These are programs where you can get involved as volunteer and/or donor, to help meet the needs of all the kids in nearby schools who are seeking help to escape poverty conditions as adults. We can also look at maps that show younger elementary aged students who will soon be deciding between homework and guns. And please do not buy into the myths. There are thousands of kids in these neighborhoods that don't shoot people, hate the violence themselves, have huge potential, and have the ambition and work ethic to invest in themselves and their communities if given the chance. RSVP to meet the Cabrini Connections program and its recent college bound graduates if you want to see a few for yourself. We need a consistent flow of investment in our maps. We operate on a limited (i.e. no) marketing budget. Most people that need to know we exist still don't know we exist. Please consider a donation, sponsorship, or referral to someone with similar interests and a philanthropic budget. Ten More Shot Last Night. More Warm Weather Predicted. I overheard a conversation this morning while taking the Metra, a commuter train I ride daily. Usually the train is full of quiet business men and women, faces buried in laptops and newspapers. But today, two downtown-bound young men were among the hoards of weekend riders coming in from the affluent North Shore to take advantage of an unseasonably warm Friday afternoon in Chicago. As we approached downtown, one guy surveyed the urban landscape and was reminded of what he saw on the "6 o'clock news." He turned to his pal (with an enthusiasm typically reserved for sharing really great gossip), "Did you hear about that shooting in Chicago this morning?!" The other man hadn't heard the news, so his buddy continued to fill him with his recollection of the details, "Yeah... someone got shot on 60th and then some more people got shot while the police were there!" I bit my lip. I knew the story and I knew the neighborhood. And I just want so badly to one day hear strangers discussing a shooting in Chicago within a framework of "my god that's horrible," or even better, "what can we do to help make sure no one else gets killed?" Should I have intervened at this point, and tried to instigate a discussion about our work here at Tutor/Mentor Connections (T/MC) ... about our strategies and tools, which help build more and better mentor programs for at-risk youth, in hopes that young kids in poor neighborhoods get the decision-making and academic skills needed to sidestep the violence of gangs (whose members are eager to provide alternative forms of "mentorship" to new recruits)? Should I have noted the research we continuously cite that lays out how the cost of poverty and the escalating crime will continue to affect taxpayers, residents, and tourists everywhere (including the places these guys were coming from), if we don't do something together as a whole? Maybe I should have. If for no other reason than to make sure they had the numbers right. 6 shot in Englewood near 66th and Ashland. 1 shot near 64th and Ashland, in a separate shooting two blocks away. 1 shot in Bronzeville just to the northeast, in a drive-by. And 2 more shot within a stones throw of the Oak Park Green Line in the Austin area on the West Side. Ten shootings in the first 24 hours of "nice weather" (quoting the "meteorologist" I saw on the news this morning myself). But erring on the side of not being counterproductive and freaking out a couple of vacationing strangers, who were otherwise minding their business, I just headed off to work to make that map above. With a hole in my lip. I mean, I really can't blame people for looking at these crimes as some sort of twisted form of entertainment. With the way most news outlets deliver the information... flashing graphics and dramatic theme music... some hyped-up on-the-scene reporter in front of a parade of police cars, providing almost no detail. It's all presented like a circus. To be fair, sometimes print publications like The Red Eye actually do dedicate resources to details, tracking and mapping the crimes, like we do at TMC. However, no one I know maps the crime data in relation to indicators of "at-risk" behavior, like poverty and poorly-performing schools... potential predictors of anger, gangs, and future violence. It also seems that few news sources direct concerned residents to groups and community assets near the crime... places that are specifically working to make sure kids who see this violence from their front window today become future leaders, instead of new tax-payer burdens on our economy later. T/MC does this with our maps and strategies. This distinction is why I hope you click on the map above to get a general sense of where the ten shootings occurred over the past 24 hours, in relation to poverty and known mentor programs. And then share our map technologies with people in your network. 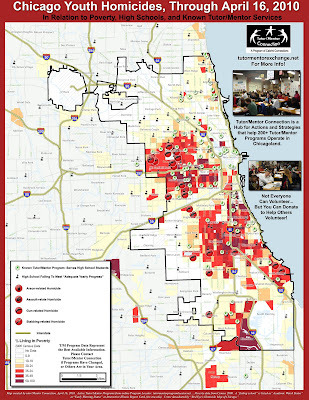 By the way, while you're looking at the map, note there are virtually no mentor programs near the shootings. Navigate my blog, or go to Dan Bassill's blog (a 30-year expert on mentoring) to learn more about why this is a problem. Then go to Tutor/Mentor Exchange to see reports, strategies, and other links to information you can use to make sense of this and lead others in your network on behalf of mentoring kids. That last part is vital. Spend a few minutes thinking of people in your network who might want to get involved. We at T/MC in particular, desperately need talent and money to take our not-for-profit technologies to new levels of usefulness in the battle against poverty and crime. 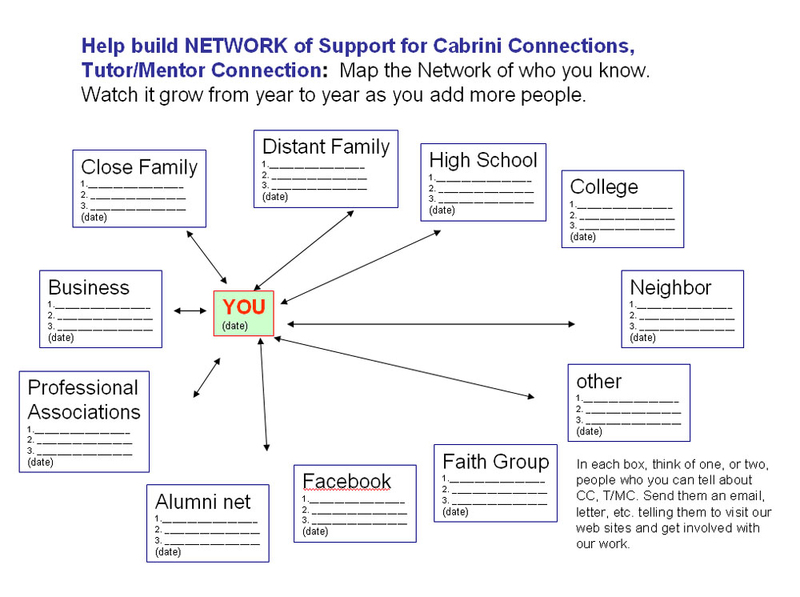 Use the form below to jar your memory and shake out those in your network who might want to help. Email me or Dan with questions or leads. And be safe this weekend! It's supposed to remain unseasonably "nice."